Although the saga of Mikhail Khodorkovsky continues to unfold, it began long ago with an ambitious young man very different from today’s middle-aged prisoner. Russian Reporter traces the evolution of Russia’s one-time richest man from a dedicated Young Communist to cynical businessman to interpreter of the Bible, and reflects on the impact his changing views on life have had on his own life and to some extent on that of the country. “Intellectuals did not discover that Khodorkovsky was a democrat until he was jailed. Before that, he was considered to be a lucky businessman or a clever thief,” said Alfred Kokh, former Deputy Chairman of the State Property Committee in charge of privatization, who is now a writer and publisher. “All Russian oligarchs are fiendishly ingenious, fiendishly strong, malicious and greedy – tough customers to deal with. Khodorkovsky was no worse nor better than the rest,” said Sergei Aleksashenko, a former deputy chairman of the Central Bank. Yet an assessment of Mikhail Khodorkovsky before his imprisonment does nothing to explain his metamorphosis or its extent. In 1987, Leonid Nevzlin, a 28-year-old programmer at the foreign trade agency Zarubezhgeologia, came looking for a job at the Young Communist League’s Youth Science and Technology Center, headed by Mikhail Khodorkovsky. “My aim was to look at him and see if one could do business with him,” said Nevzlin, a fugitive oligarch who now lives in Israel. Khodorkovsky seemed to fulfill all of Nevzlin’s expectations, and together the men quickly turned from orthodox Communists preaching the gospel of socialism to apologists for the free market. Khodorkovsky and Nevzlin made their first millions by cash-out transactions, selling computers, jeans and fake French cognac. In the free-for-all period of Russian capitalism, the laws were flawed and were honored more in the breach than in the observance. “Khodorkovsky drew the line himself, and even if we walked pretty near the line, we never crossed it,” Nevzlin said. Many react to these words with skepticism. As Alfred Kokh said in a public lecture, “The business community disliked Khodorkovsky the businessman. He liked to repeat two theses. Thesis one: ‘If we had a proper state, I would long since have been in jail.’ Thesis two: ‘What is mine is mine; what is yours is negotiable.’"
If these words are taken literally, the state appeared in Russia in 2003. Most people, however, concur that Khodorkovsky never crossed the line, or did it so skillfully that nobody noticed. In 1990, Khodorkovsky became adviser to Russian Prime Minister Ivan Silayev, who was a Yeltsin supporter. Both backed him in August 1991. Yeltsin prevailed, the Soviet Union collapsed soon afterwards and heady prospects opened up for businessmen who had backed the new Russian government. By that time, Khodorkovsky and Nevzlin had their own bank called Menatep. In 1995, investment tenders and loans-for-shares auctions were initiated. Menatep, which was wallowing in money, bought close to 100 factories across the country, with its purchase of Yukos as the jewel in its crown. Within two years, its capitalization increased to $4 billion. The goal set in the “Man with a Ruble” manifesto was achieved. At the time, Mikhail Khodorkovsky was innocent of the notion of social responsibility. In due course, he was accused of asset-stripping Yukos and of transferring the bulk of its profits to offshore zones. Shortly before his murder in 1998, the Vladimir Petukhov, the mayor of Nefteyugansk, put a little plate on his desk that read, “No money.” Petukhov had endured a grueling battle with Yukos over taxes, which contributed 95 percent of the city’s budget. Petukhov had calculated that Surgutneftegaz, another oil major, was paying a hundred times more tax than Yukos for every ton of oil. He told Moscow journalists about the budget deficit and wrote complaints to the tax authority, the FSB and to parliament. He demanded that Yukos be taxed more, or that its accounts be blocked. After Petukhov’s murder, investigators found these letters on him and regarded this as the main proof of complicity by Yukos managers in the crime. Before the murder, Khodorkovsky was so annoyed by Petukhov that he just stopped paying taxes to the municipal budget authorities; instead, he brought bags of cash from Moscow and paid public sector employees in cash. Yukos assumed government functions because it felt it could perform them better. “This was not normal? Yes. But, nobody ever said it was unlawful,” said Nevzlin, who was convicted in absentia of masterminding Petukhov’s murder, though he denies any complicity. Khodorkovsky emerged from this episode with the conviction that he had the moral right to supplant the state if it could not do its job properly. Yukos was becoming a state within a state, duplicating some of its functions and building up its own security service. But Yukos was not the only company to behave in this way: The security services of many big Russian corporations came to resemble government special services, and often surpassed them in terms of equipment and the scale of their activities. As a result, in 2000, some members of the Yukos security service were convicted of murder and received long prison sentences. On the eve of the 2003 Duma elections, Khodorkovsky bankrolled the liberal parties Union of Right Forces and Yabloko, while other Yukos shareholders financed the Communists. There was nothing new about the practice of Yukos backing “its own” candidates in the regions where it had business interests. But, to this day, many believe that the true reason for the prosecution of Khodorkovsky was that he financed the opposition at the national level. Khdorkovsky might have gotten away with this plan but for his remarks during Putin’s meeting with businessmen on Feb. 19, 2003. The meeting was about corruption, and Khodorkovsky accused state oil company Rosneft of corruption in its deal to purchase Severnaya Neft. Later, in prison, Khodorkovsky would write that concern for property had taught him to be tight-lipped when necessary. Perhaps pragmatism and self-control failed him on this occasion, because the owner of Yukos imagined that he was not just one businessman, but someone who had serious public support, since Yukos had been spending generously on charitable and educational projects. 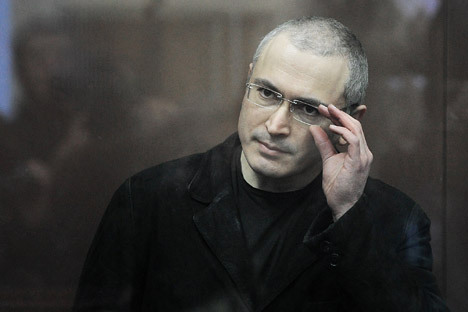 The evolution of Mikhail Khodorkovsky was complete. To make people believe that he has reformed is a good way for a prisoner to secure an early release. Yet it looks as if Khodorkovsky is not pretending. He no longer has his billions, and he seems to be pleased to describe himself as a member of the “well-heeled middle class.” He has become a socialist. He does not declare any serious political ambitions. But the state is still afraid to let him go. This irrational and meaningless fear was confirmed on Dec. 27.